RISALPUR: Militants in Pakistan have found clever ways to hide homemade bombs. They've been strapped to children's bicycles, hidden inside water jugs and even hung in tree branches. But the most shocking place that Brig Basim Saeed has heard of such a device being planted was inside a hollowed-out book made to look like a copy of the holy Quran. A soldier who went to pick up the book from the floor was killed when it exploded. ''Normally if that book is lying somewhere on the floor, you tend to pick it up immediately just for respect,'' said Saeed, the chief instructor at a school training Pakistani forces how to detect the so-called improvised explosive devices, which have become increasingly popular in wars in Iraq, Afghanistan and the insurgency in Pakistan's northwest, near the Afghan border. Saeed and other instructors at the military's Counter IED, Explosives and Munitions School say it is important to constantly come up with new ways to prevent such homemade bombs because that's exactly what the militants are doing. 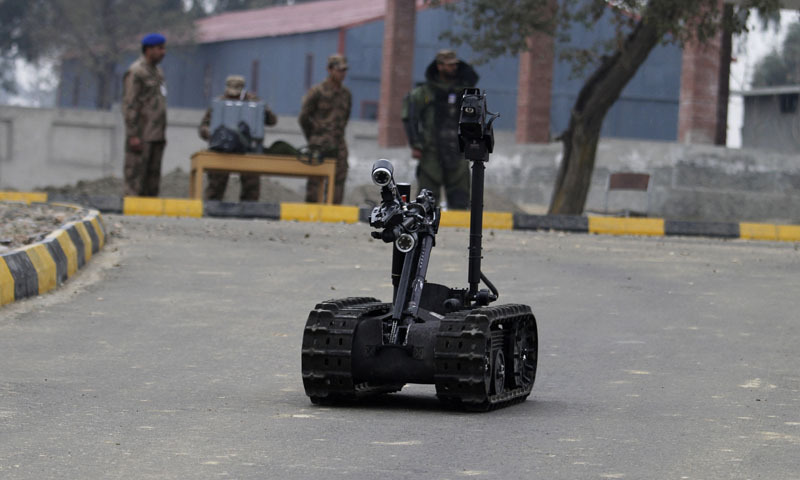 The Pakistani military has sharply ramped up efforts to deal with such devices in recent years as they have emerged as the militants' preferred weapon. So far, 4,042 soldiers from the army and Frontier Corps have been killed and more than 13,000 wounded in the war on militants in the country's northwest since 2002, according to the Pakistani military. The homemade bombs account for most of the casualties. The US military, which in the past has said Pakistan hasn't done enough to restrict the use of certain fertilizers used in bombs in Pakistan and targeting foreign and government troops in Afghanistan, welcomed the bomb squad school, which formally opened in 2012 on a military base in the northwestern city of Risalpur. 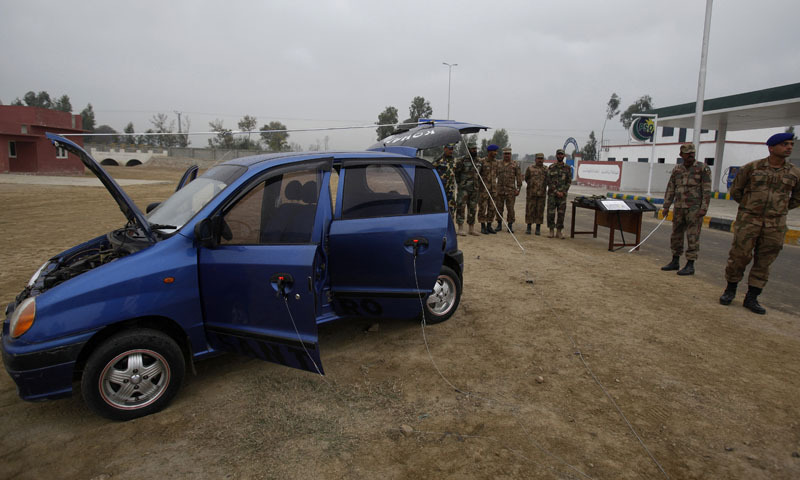 ''We're very encouraged by the efforts that we understand the Pakistanis are taking there,'' said the head of the Pentagon's Joint IED Defeat Organisation, Lt Gen. John D Johnson. The Pakistani military also has moved to restrict the availability of calcium ammonium nitrate-based fertilisers frequently used in Afghanistan, and to develop a fertiliser dubbed CAN+ that would work on Pakistan's soil but not detonate. And it signed an agreement with the US last year designed to help the two countries work together to fight the roadside bombs by sharing information in areas such as militant tactics and funding. US experts are to travel to Pakistan to supply it with hard-won knowledge earned in Iraq and Afghanistan. Separately, the British military has provided instruction. The school's goal is to teach security forces where bombs can be hidden, how to look for them and their components and how to gather intelligence from them such as fingerprints so that authorities can track down militants. The Associated Press was the first foreign media outlet to be allowed access to the facility, according to the Pakistani military. During a recent visit, students were practicing using equipment to search for devices planted in the ground or using remote-controlled vehicles to approach possible explosive devices. Others cleared a path to a suspected militant house and marked the path with yellow flags so that troops coming behind them would know where to walk. The school is designed to mimic scenarios the security forces might find in real life in classes that last from three to eight weeks. It includes a mock urban environment with a market, a gas station and other buildings, and explosive devices are even hidden in a pond and a graveyard. Troops practicing a search of a residential compound may accidentally open a cupboard, setting off a loud buzzing that signals an explosion. An escape tunnel leading from one of the houses is rigged with trip wires. ''We face it whenever we travel or if there is a compound, a path or some other place, it is always in our mind that there could be some IED,'' said one soldier at the school, Noor ul Ameen, who has served in the northwest and the insurgency-plagued Balochistan province. Most of the students have been from the military, but officials are trying to include police and other security agencies because they are often the first on the scene when a bomb goes off or an unexploded device has been found. 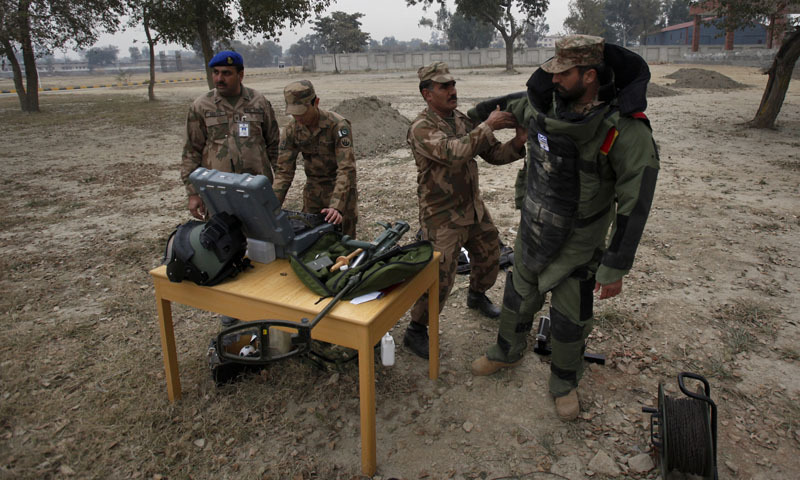 Pakistan's police often lack the training and the equipment to deal with such explosives. Even the more equipped army doesn't usually have armored vehicles to move troops. back at eid ul fitr when i was in queeta, a corpse borne IED was found out side the cantonment gate,, some one had taken a dead body , taken its organs etc out and stuffed it with a bomb. And the TTP thought that no one will notice a dead man lying on the side of the road? Oh my my, how clever!